This small primate species has black fur covering its body. Their tails can have light rings at the base, and individuals may have white markings on or around the face. 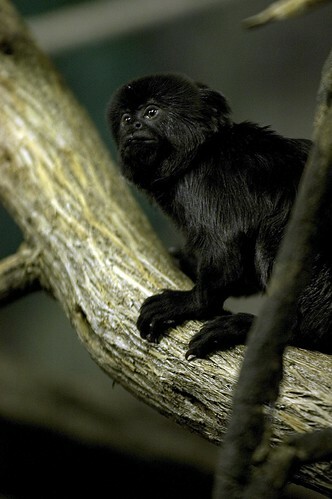 Adult Goeldi's monkeys average only 22 ounces in weight. The species occupies the Amazon forests of northwestern South America. 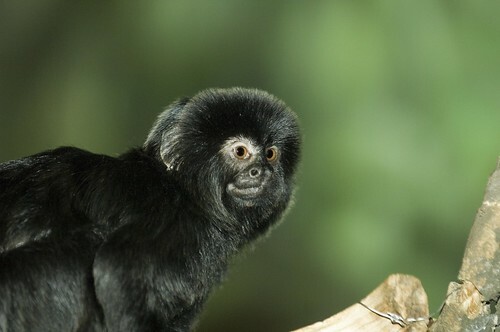 Goeldi's monkeys are listed as endangered by the U.S. Fish and Wildlife Service. Lincoln Park Zoo participates in the Goeldi's Monkey Species Survival Plan®, a shared conservation effort by zoos throughout the Association of Zoos and Aquariums. 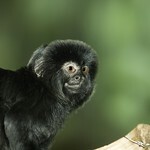 Goeldi's monkeys favor rain forest with developed undergrowth. The species feeds on fruits, insects and small animals. They typically stay at lower elevations, although they will travel higher in the trees to find fruit. They are excellent climbers and jumpers. 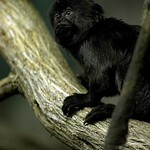 Goeldi's monkeys live in small groups, typically consisting of a breeding pair and their offspring. Because of the large size of the offspring relative to the female, the male takes an active role in carrying and caring for young. Mothers carry offspring for the first two weeks, after which males and other group members may carry the young. Groups communicate via vocalizations and scent-marking.